I published this recipe in March of 2011 but have since revamped it! I hope you will enjoy! Recently couponing and sale shopping for me some gluten free oatmeal for fifty cents a container. The other night I was staring at all my cheap oatmeal, wondering what I could make with it because I am the only one eating the stuff. 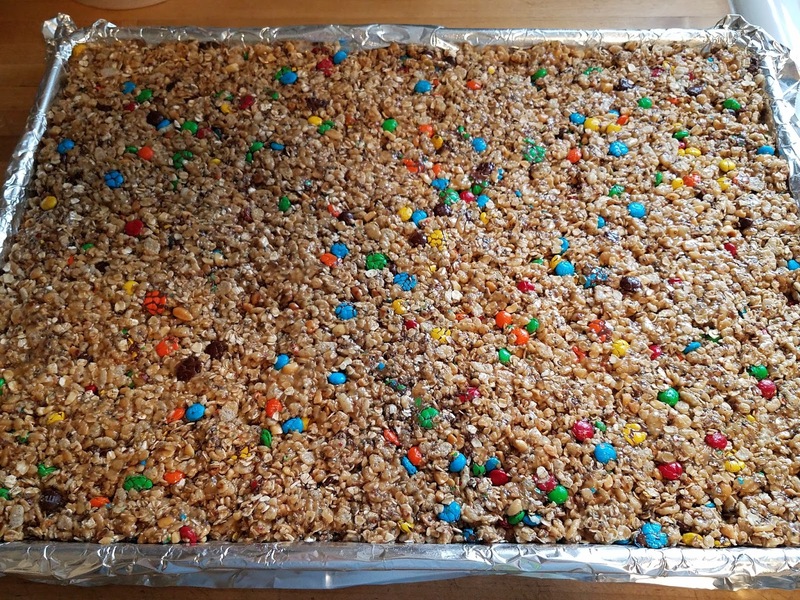 It dawned on me, granola bars for the kids! I peeped into the pantry hmmm lots of peanut butter, several boxes of rice crispy cereal and of course my quick oats so it just made sense to make granola bars. I am all about saving money and store bought bars can cost a small fortune with hungry little kids and their friends eating them all up. I found several recipes online for these but none were what I was looking for. I made my own little recipe and it turned out quite nicely despite my zombie like state of mind. I chose to make peanut butter bars with candy coated chocolates inside, chewy and every bit as yummy as store bought but for pennies on the dollar plus I could add in other healthy ingredients as I wished. 1 cup of whatever you wish to mix in!